Front hood reminds me of 993. Don't know why they didn't make the front hood flush with bumper and side fenders. It may have already been said, but the 992 very much reminds me of a modern 964. Please fix the third brake light, cup holder, and PDK shifter. Why is that brake light taped up? omg, it totally looks Ugly. Porsche Engineers & Dealers (you all can persuade people at the Corporate office) - I know so many of you are all in here - why? You know it looks ugly, why go with it. Also I need my PDK Shifter - not some razor. Again you know it is ugly, fix it. Simple. Also fire the person who gave those suggestions to implement. Make good decisions and your VW stock will go up....don't want your stock to be up? While there is some inspiration there, it looks even more like a 991.2 C4S. Can you post that comparison? Agree. Looks like what a 991.3 C4S would be. I'm sure it will look great in person. 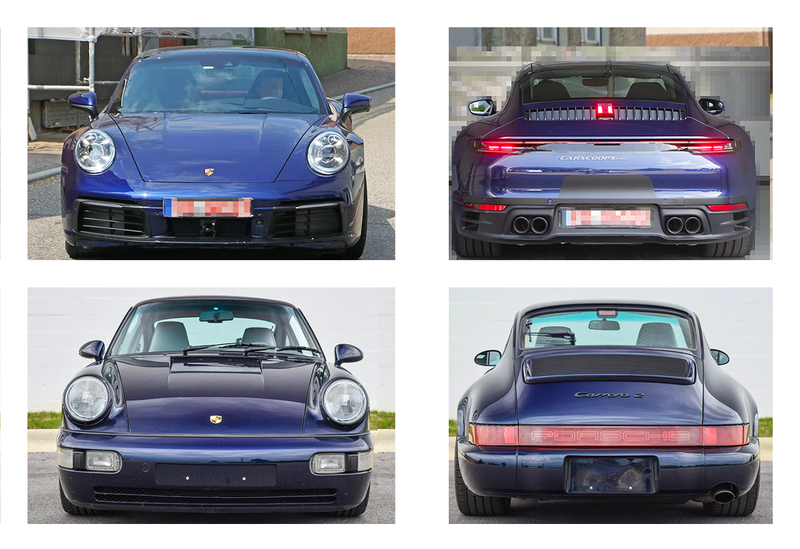 911s are also very spec dependent. Looks like parts of rear end are still camouflaged. Brake light will probably look different on final version. You can clearly see how the 992 incorporates design cues from pre-996 generations. 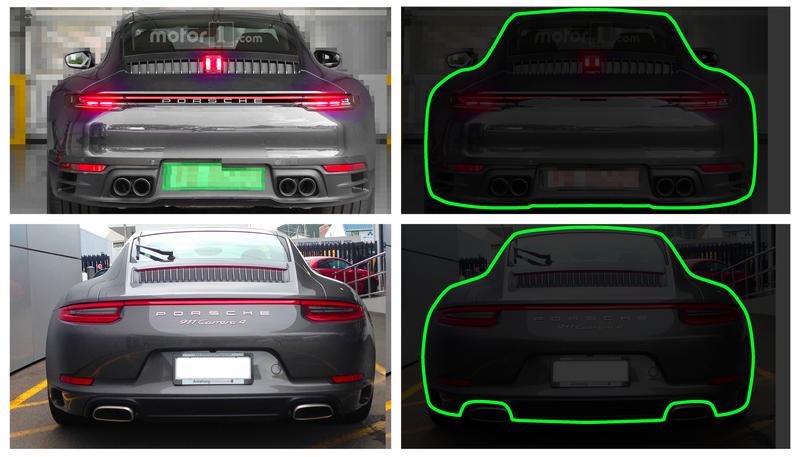 Here's a comparison between 991.2 C4S and the 992. On the left is mostly the photo as-is from the internet. I did duplicate the center brake light to remove the tape. I also added the Porsche logo and adjusted the bottom of the bumper/license plate area. These photos are obviously of a european-spec vehicle, but the US bumper is slightly different (from photos posted in this thread). I've left the right side of the bumper so you can compare a theoretical US-spec versus European-spec, side-by-side. On the right, I've darkened the image and created a silhouette of each vehicle. Obviously the photos were not taking at the same place, same distance or with the same lens so I've made a little bit of adjustment for perspective. It's not perfect, but at least you can compare. Also, I'm trying to do a digital measuring "session" based on most of these photos, need higher res though. Another side now, how do you access the engine? The louvered vent/intake area looked fixed. It seems that Porsche always uses the polished stainless side window trim on its show/promotional cars. 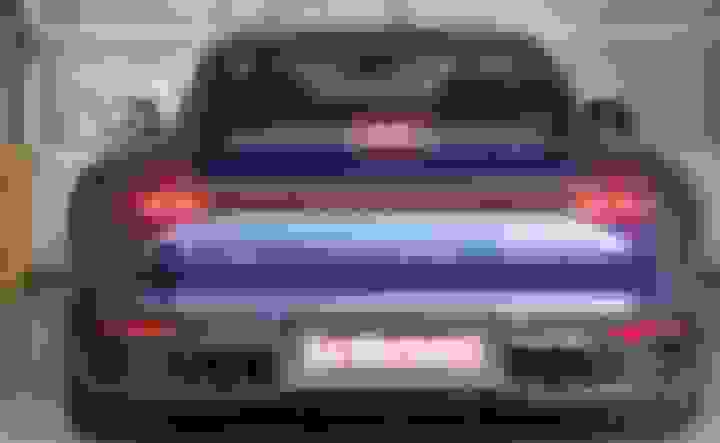 By the way, the third brake light will be incorporated very well into the design. It has to be!! 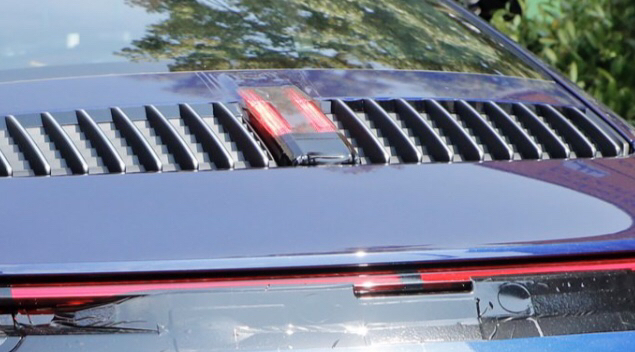 From the bulky plastic bits on the rear vents, it could just be a housing for LED illuminated grille. Now that would be a GREAT design element. Porsche designers, are you listening??? We know you are. Get on it!!! They would need to figure out the lights being able to detach from the grill for service. Not brain surgery there.